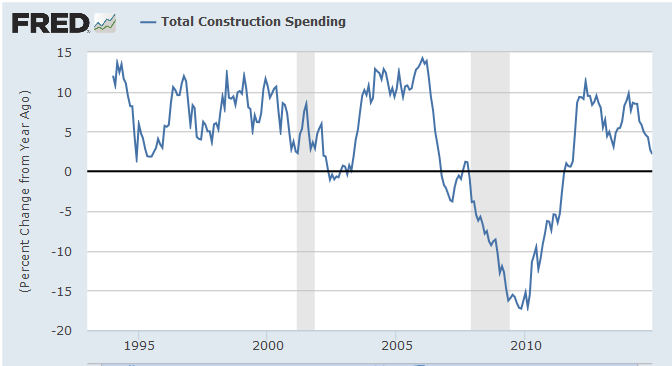 Construction spending for December was weaker than expected. Lots of reports recently have been "weaker than expected". From Bloomberg. Construction outlays rebounded 0.4 percent in December after dipping 0.2 percent the month before. December was below market expectations which were for a 0.6 percent gain. December's increase was led by public outlays which rebounded 1.1 percent after dropping 1.8 percent jump in November. Private residential spending rose 0.3 percent after edging up 0.1 percent in November. Private nonresidential construction spending eased 0.2 percent in December after a 0.8 percent rise the month before. On a year-ago basis, total outlays were up 2.2 percent in December compared to 2.7 percent in November. 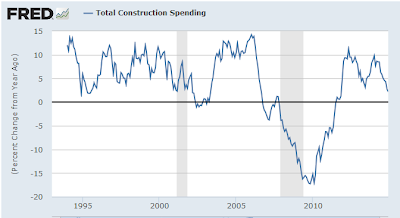 Construction spending slipped 0.3 percent in November after a sharp 1.2 percent rebound in October. Market expectations were for a 0.5 percent gain. November's decrease was led by public outlays which fell 1.7 percent after a 2.8 percent jump in October. Private residential spending rose 0.9 percent, matching the pace the month before. Private nonresidential construction spending dipped 0.3 percent in November after edging up 0.1 percent in October. This is another trend that looks ominous. 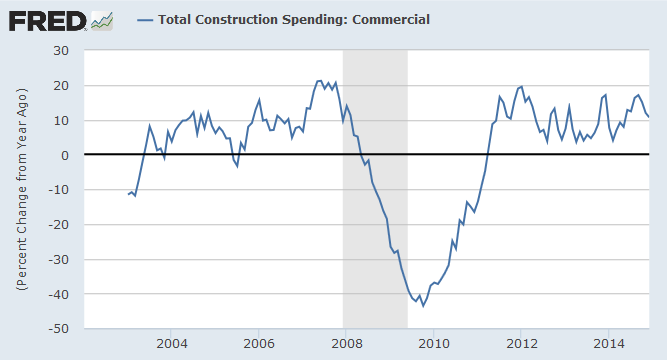 Year-over-year growth in total construction spending has fallen from 8% in February of 2014 to 2% in December. 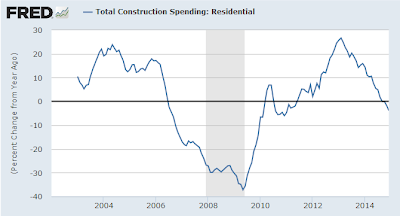 Residential construction spending will be a net contraction from 1st quarter GDP unless the trend reverses soon. But why should it? And if residential drops deep enough, total construction spending will subtract from 1st quarter GDP.